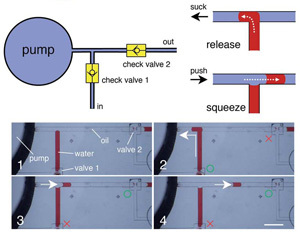 Microfluidic devices are able to process small volumes of liquid and are comprised of microscale components, but the devices themselves are not often small themselves. These labs-on-chips are often limited to lives in labs instead of the remote areas that could really benefit from their use. The limitation comes in the form of support equipment used to process or analyze assays that are expensive, bulky, energy consuming and/or require trained professional operators. Syringe pumps are often used in labs to drive liquids used in assays at specific flow rates and to ensure that the right volume is used. The need for complicated, external flow equipment was recently addressed by a group from Peking University. The group’s paper, “Squeeze-chip: a finger-controlled microfluidic flow network device and its application to biochemical assays” was recently featured on the cover of Lab on a Chip. The squeeze-chip is comprised of two check valves on either side of a reservoir. Squeezing the reservoir pumps fluid through one check valve. The reservoir is refilled after release through the second check valve. The ‘squeeze-chip’ is based on a system of check valves and finger-operated pumps. Check valves allow fluid to flow in only one direction and, in this case, are fabricated from PDMS and integrated into a microfluidic card. The pump is a fluid reservoir that can be depressed by a finger. Squeezing the reservoir evacuates fluid through one of the check valves oriented to pass fluid away from the reservoir. After releasing the reservoir, it draws fluid in through a second check valve that’s oriented in a different direction so that it can only feed liquid into the reservoir. Alternatively, specially designed squeeze-chips can handle two immiscible fluids so that with each pump, a small plug of one fluid can be inserted into the system and is sandwiched by the other fluid. The displaced volume is not always equal, but the reservoirs feed into metering channels which only accept a specific volume, adding some control to the squeeze-chip. The authors have had success in delivering volumes ranging from nanoliters to microliters. This is the basic setup for a squeeze-chip, which can be combined with other units to create a more complex, sophisticated system. Alternate design of the squeeze-chip creates liquid sandwiches one fluid in another when immiscible. 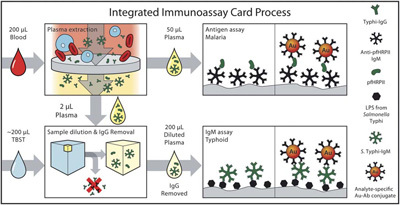 The researchers demonstrated the squeeze-chip’s ability by running colorimetric assays to measure glucose and uric acid at clinically relevant concentrations of 0-10 mM and 0-15 mM respectively.. These assays comprise a system of squeeze-chips that mix solutions, resulting in a 4mm thick readout chamber, allowing the user to see the solution’s color with the naked eye. The researchers were able to detect glucose as low as 1 mM and uric acid as low as 100 µM with initial sample consumption less than 5 µL per test. Limits of detection can be lowered by increasing the readout chamber thickness, which would make the color darker. 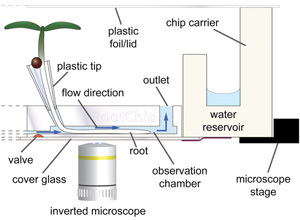 Sample operation of squeeze-chip used in colorimetric assay. I think that the squeeze-chip is a great component to make devices more viable outside of the lab, though it may not be suitable for every card. The metering chambers add some volume control, but, again, this may not be enough. More importantly, volumetric flow rate isn’t controlled, which eliminates the squeeze-chip as a viable option for applications requiring more stringent regulation. There are several considerations that need to be kept in mind when designing any lab-on-a-chip for use outside the lab. Despite any microscale magic taking place, the end-user and intended environment need elevated priority, meaning that these devices need to be relatively cheap, free of any tethers to an advanced lab and operable by people with limited education. The squeeze-chip certainly addresses cost and eliminates a connection to an external syringe pump. It can be operated by hand, or even operated by an actuated piston if the chip is predestined to function in some housing. Usability testing results would be interesting to see as well, including performance variation among users, but it looks like devices using the squeeze-chip can be readily used in areas of need. Some of us are on the search for new renewable materials that can make our lifestyle a bit more sustainable. Although a new resource may be renewable, that doesn’t mean it makes sense to use. For example, many people went crazy over corn-based ethanol because it would eliminate (or at least reduce) America’s dependence on foreign oil. America is the world’s largest producer of corn, but that’s for a reason; we use it for a lot of things already. By diverting a percentage of corn production towards ethanol, we shook up our corn economy, and not necessarily for the better. 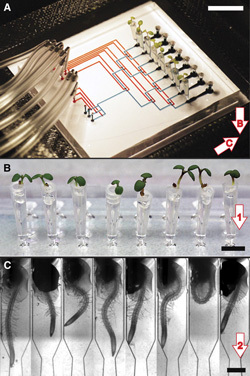 Yet we find ourselves looking to corn again, but this time as an alternate material for microfluidics. Gang Logan Liu et al. have presented us with a new method for corn-based microfabrication in "Green microfluidic devices made of corn proteins". The group from the University of Illinois Urbana-Champagne uses the protein zein, which is actually a byproduct of ethanol production. An existing product previously treated as waste now has the promise of new value; this is exactly what we’re looking for as a green resource. Not only would this corn-based device be renewable, its disposal would also be more environmentally friendly. The authors stress that this is important in sectors that perform a high number of tests. This could be particularly important for agriculture, which needs to constantly test for pollutants and diseases (it would also give a nice ‘full circle’ type feeling). 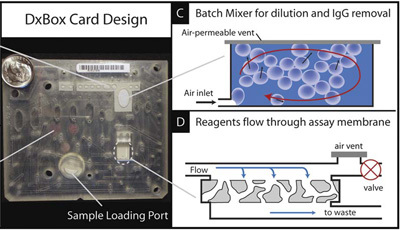 I’m normally more interested in medical applications for microfluidics, but there are a ton of areas that run chemical tests that can be optimized. This is not the first time Zein has been examined as a viable resource; it has been studied for use in coatings, adhesives, food packaging, drug and functional food delivery systems. Zein is a good candidate for microfluidics because it resembles a rod, and self-organizes with other rods into a two-dimensional film. The authors employed a soft lithography fabrication process using PDMS as a master. Once a single layer was molded, the authors examined binding processes with glass slides as well as other zein layers. While it is conceivable that someone would want to use a glass-zein or zein-zein device, it is also necessary to test it with glass because zein is opaque and prevents us from visually evaluating how well it functions. Zein film is prepared via soft lithography, using PDMS as a master. It is sealed to another surface by applying it to ethanol solvent or vapor. Two methods for attachment were considered: solvent and vapor deposition. Both methods involve heating the surfaces and coating with ethanol before mating the sides. In solvent deposition, the zein side is placed on an ethanol-coated surface to pick up a thin layer before sealing. In vapor deposition, the zein side is exposed to ethanol vapor before sealing. The process of heating and exposing to ethanol allows the zein to become more mobile as well as crosslink with either the opposing zein surface or the micro voids in the glass. 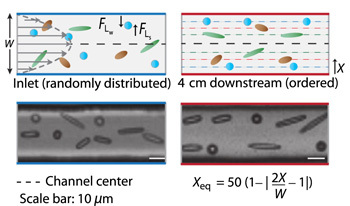 The authors tested the zein-structures in a couple different ways, but they basically boiled down to how well the channels were replicated, sealed and able to allow for normal microfluidics operations. The resulting channels deviated slightly from the master, which could be rectified by reducing the elasticity of the PDMS or changing the zein film thickness. When comparing the solvent and vapor depositions, reliable results were obtained using the vapor. When the solvent was deposited, evidently extra ethanol was transferred to the zein film, distorting the geometry of the channels. While the authors demonstrated that zein sealed well, they did note that it is a somewhat permeable material, and this could be manipulated in some controlled way. Also of note is the fact that zein autofluoresces. Zein is excited using wavelengths from 450 to 490 nm, resulting in excitation emissions at 550 nm to 580 nm. While this doesn’t line up with the properties of Green Fluorescent Protein, it might align with others, making fluorescent detection a bit harder. I think that the use of zein is promising. It utilizes a renewable material in a new way that gives value to a pre-existing process. Not only is zein renewable, but it is biodegradable, which will answer one of the problems that will surely arise when microfluidic devices have worked their way into mass production. I think we’ll have to see what complicated structures can be created with zein and what solvents really shouldn’t be used.